We went back to Ginza for the last meal of the trip, which was perfect as it would be within walking distance of our hotel. Koguma (小熊) doesn't have any macarons, therefore it's kinda off the radar screens of many overseas visitors. But one of our friends' parents visited the restaurant earlier and delivered positive feedback, and the pics on the restaurant's website (they even have an English site!) looked tantalizing. So I looked forward to a nice farewell lunch. Sesami-tofu on sea urchin top (前付：胡麻豆腐 雲丹) - a good way to start. The sesame tofu was rich and tasty. Tonight's dinner was arguably my most-anticipated meal this trip, in terms of food. Unlike last year, there were no 3-star stops on this trip. In fact, there were only two meals at starred restaurants this time around, and with two macarons, Kadowaki (かどわき) would be the top fine dining destination. We arrived a little early for our late seating, and were led around the corner to a small private room in a dark bar upstairs. The air in the room was suffocating with cigar smoke leftover from the previous evening. The six of us would squeeze in here until our private room was ready. Icefish with shirona and grilled mullet roe - a pile of icefish (白魚) sat on top of a vegetable from Kyoto called shirona (しろ菜), which isn't exactly the same as bok choy (白菜) or cabbage. A nicely grilled slice of mullet roe (カラスミ) came on the side. A little sprinkle of sesame seeds make things complete. ...which was why we found ourselves sitting at the bar at 4 p.m. Observing as Yamamoto-san made the drinks for our neighbors - who turned out to work for Asahi Shuzo (旭酒造), the makers of Dassai (獺祭). When all of us were ready, we placed our orders and eagerly awaited for our drinks. I chose the 6-cocktail set, wanting to taste a little bit more than the 4-cocktail set would offer. 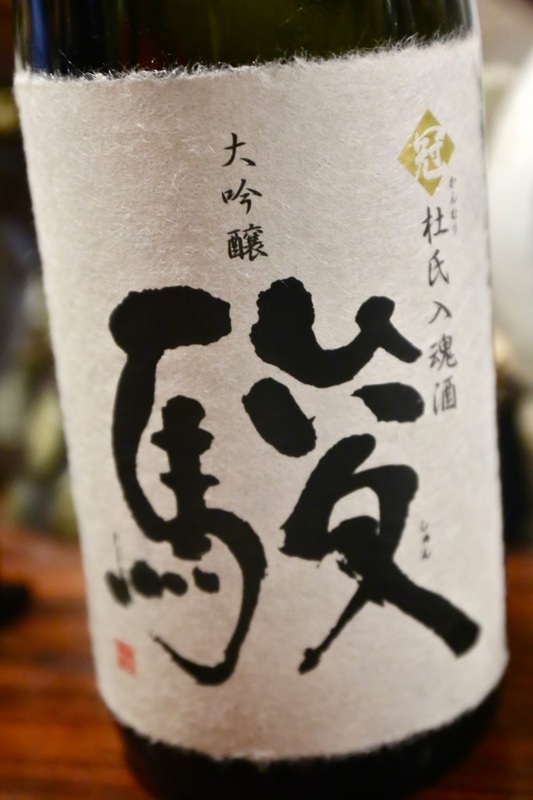 #1: This was made with a citrus fruit called Tsunokaori (津之香) that reaches maturity in March and April. Base is a shochu called Tsurunashi Genji (蔓無源氏), which uses a type of yam that was revived from 100 years ago. Sprinkled with basil flowers on top, which added a nice fragrance on top of the citrus. I try to fit in a tempura (天ぷら) meal every time I’m in Japan, and this trip I decided to check out Fukamachi (深町), which have themselves a little macaron. The location was pretty convenient and we ended up there for the second half of the lunch session. They open for lunch from 11:30 a.m. to 1:30 p.m. Arriving at 12:30 p.m. gave us less than 1 hour for lunch, and the staff asked to make sure that we were OK with finishing a little earlier. Psychologically I felt a little rushed from the start. I chose the most extensive menu, which gives you 2 prawns, 3 different types of fish, 5 types of veg, and a bowl of rice topped with a prawn cake. Pricing-wise, the addition of the prawn cake over rice costs an additional JPY 2,000… which seems kinda steep to me. Prawn heads – two prawn heads arrive to tell us that the tails are coming next. It's been nearly 19 years since Cow, Chicken, H-man and I first began working together, and we've kept our friendship over the years. I try to meet up with them on each of my trips to Tokyo, getting together for a meal (or three) over wine. It's traditional that H-man and I coordinate and bring wines to dinner - even if it involves me lugging some bottles from Hong Kong and the wines having to suffer a little bottle shock. The four of us had a pretty good time last year at La Ruée vers l'or, so H-man once again booked us a table there. Not only is the restaurant BYO-friendly, but sommelier Chiba Kazuto (千葉和外) is apparently more knowledgeable about and adept at handling Californian wines. This was important because the theme I had proposed for tonight was one of California's highly sought-after wineries - Sine Qua Non. H-man and I would each bring a pair of wines from the same vintage, with the pairs being 10 years apart. As soon as I arrived and dropped the wines off with Chiba-san, I delivered another package to the H-man. He had totally forgotten about the fact that I had bought a copy of Sine Qua Non's book, since the purchase was made almost a year ago. He was ecstatic at the sight of the beautifully-crafted book, and no doubt would spend some quality time perusing through it. As usual the menu was pre-set for us, knowing that we would be red-heavy in terms of wine. Amuse bouche - anchovy sablé and a chiffon-y onion short cake. Chilled cauliflower cream soup, firefly squid and nano-hana confit - Wow! This was absolutely beautiful! I loooove chilled soups, and this one was so creamy and so sweet. Did I mention that cauliflower is one of my favorite vegetables? And they added a nice touch with the firefly squids (螢烏賊) that are now in season, after they have been marinated in olive oil with garlic, aglio olio-style. The rapeseed flowers (菜の花) were also a nice seasonal touch. So refreshing and awesome. I enjoy a bowl of ramen (ラーメン) as much as the next person, but I don't go ga-ga over them. Especially not when I'm outside of Japan. There's a lot of mediocre crap out there, and I never know what's actually in the soup base in the bowl in front of me. But things change when I'm in Japan, and once in a while I'll go and get my fix. For the longest time my go-to ramen was Hakata Tenshin (博多天神) - a chain that my friends Cow and Chicken introduced me to a long time ago. It's been a few years since I last paid them a visit, and since there was a branch only steps away from the Robot Restaurant (ロボットレストラン) in Kabukicho (歌舞伎町), it seemed like the perfect opportunity to slurp down a bowl after the show on our first day. The reason I love the ramen here is the soup base. It's probably the only ramen soup that I can handle drinking an entire bowl of, since it's pretty much devoid of MSG and not excessively salty. The reason is simple: they make their own stock from pork bones, skin, and fat. 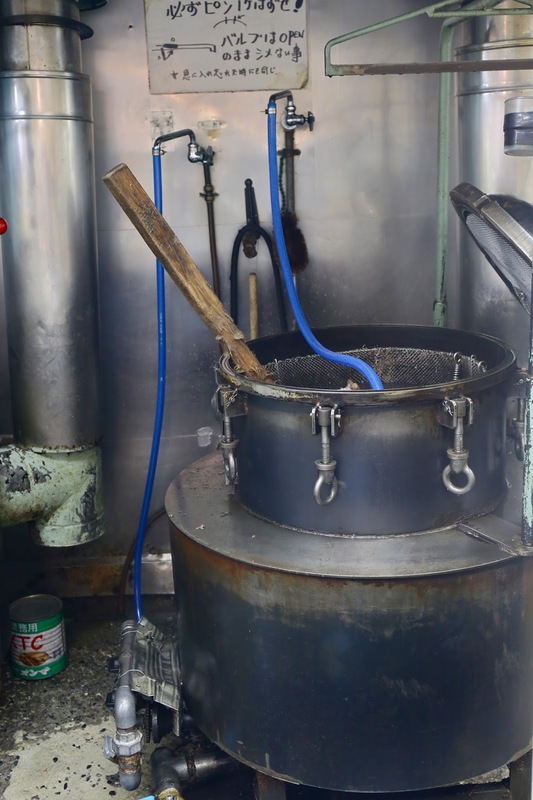 I know this because each branch has its own huge pressure cooker, and occasionally while you sit and slurp down your noodles, you can see the staff dump the raw materials into the pot, use a hose to fill it up, stick a wooden oar into the pot and stir... before closing the lid and boiling the hell out of the contents. This particular pot is actually on the small side, as the one in the Shibuya branch requires someone to climb a ladder in order to access the opening. The result? A milky-white broth that is rich in flavor but light on salt. Dinner time rolled around, and I found myself at Yoroniku (よろにく) once again. Before my friends graciously agreed to let us tag along on their Tokyo trip, they had already made plans to come here based on my recommendation, so of course I was only too happy to be back at this very good yakiniku (焼肉) joint. There was a little miscommunication regarding our booking. Due to the original size of our party - before a couple dropped out - we were booked into a private room. Apparently one must take one of the two set menus if one books a room, but I always found their set menus boring... and of course I had the audacity to tell it to the manager's face! After a quick discussion with the manager - and assuring him that we were hungry and would order enough food to at least cover the cost of the set menus - he kindly agreed to let us order à la carte. Yay! Maybe it's because we were in a private room, but I don't recall getting an amuse bouche last year. There was a mix of bamboo shoots, tofu, seaweed (青海苔), and sansho leaves (木の芽). It's our first morning in Tokyo, and we met up with some friends for a late breakfast/brunch. Hello Kitty was catching up with one of her friends from Hong Kong who had settled in Tokyo, and we were also joined by 娜姐 who had just arrived earlier today. 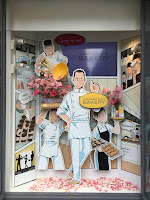 When Dominique Ansel Bakery opened up in Tokyo last year, I was unable to join a bunch of friends for the opening party as I was busy with work commitments. 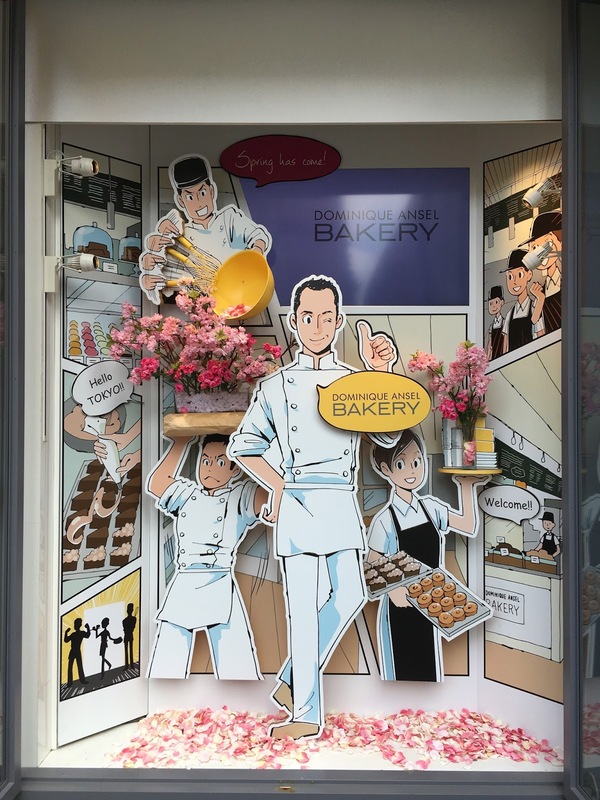 Therefore I was determined to make it here and try out some of their Tokyo specials - especially their Cronut. The location is pretty close to a prime shopping area, so I was pretty happy that everyone was agreeable to my choice of venue. After a couple of quick stops to fill our stomachs while recovering from the overwhelming Robot Restaurant (ロボットレストラン), I decided to be lazy and took a cab to our next stop. It's a pilgrimage I have to make on every trip to Tokyo, and I'm glad I got the chance to come back to Tamanegiya (酒たまねぎや) once again. As usual Master served up a little amuse bouche... with some braised fish and also a couple of cape gooseberries. The cape gooseberries were very ripe and sweet tonight. Shun Kanmuri Daiginjo Tobin Show Special (駿 冠 大吟醸 斗瓶選抜酒), 26BY - with a seimaibuai (精米歩合) of 40%. Nose of banana and a little bit of fermented rice, but surprisingly smells a little dry. Nice sweetness on the mid-palate with a dry finish. I'm back in Tokyo for a quick trip during cherry blossom season, with Hello Kitty in tow for a visit to HelloKittyLand. Unlike my previous trips from the last few years, though, this year I would be hitting a few touristy spots along the way... starting from the very first stop after we landed and checked in. I first heard about the Robot Restaurant (ロボットレストラン) from JC, whose photo album from three years ago entitled "Japanese chicks battle robots" showed a series of bewildering pics. I found them amusing, but I was never gonna make it one of my stops when I'm in Tokyo. When Fergie and I walked past it by chance two years ago, I snapped a picture outside the place, but of course our schedule was already full. I knew there would be numerous venues around town offering special creations as Art Basel Hong Kong rolled into town this week, and I wanted to see what else was available besides Uwe's creations. As I browsed through Hong Kong Tatler's article on the subject, the first item that popped up was this cocktail at the Artesian - the bar at the Langham Hong Kong. The picture showed what looked like one of Salvador Dali's clocks draped over a cocktail glass, and this immediate caught my attention. After making some enquiries, I made a reservation and showed up with Hello Kitty. We were informed beforehand that each cocktail takes some time to make, so we would need to be patient... and this was the reason why reservations are necessary. The bar area was half-empty when we showed up, and it appeared that no one else was there to enjoy these special cocktails. Perfect for us, then... since we didn't have to wait our turn. 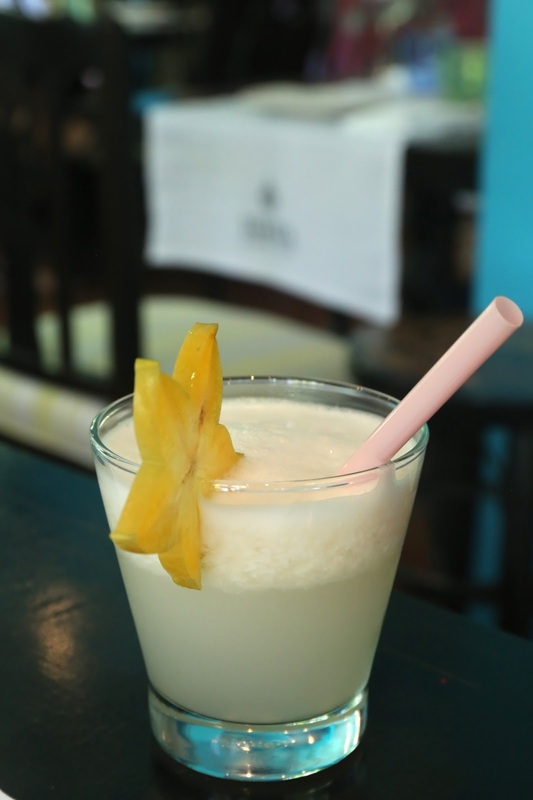 When bar manager "Rush" Limbu started on the first cocktail, we immediately realized why they take so long to make. The base of the cocktail is made first, with a layer of egg white foam on top that acts as the "canvas". Then Rush puts different food colorings on a plate - his "palette" - and proceeds to draw on the foam with a toothpick. Art Basel Hong Kong is upon us, and every year around this time, Chef Uwe Opocensky and his team at the Mandarin Oriental Hong Kong - the Official Hotel Partner for Art Basel Hong Kong - would come up with an "art menu" to celebrate the occasion. I've had some of those creations in the past years, but this was the first time I came to the Mandarin Grill + Bar just for the Art Basel dinner menu. I've been meaning to come back and visit Uwe during this period, and when My Favorite Cousin offered to take us out to dinner to celebrate her promotion, this became an easy choice. 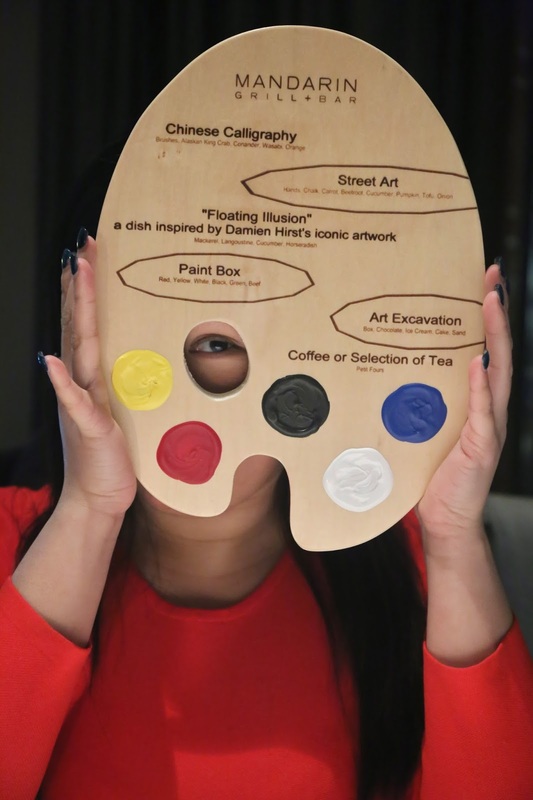 The menu tonight was presented on an artist's palette, and since Hello Kitty and I are silly people, she decided to pose for a picture with the menu... Peek-a-boo! Once again Curry took us to Seventh Son (家全七福), one of the top Cantonese restaurants in town. This year, however, he chose not to serve up a vegetarian menu like last year... although a few of us probably wouldn't have objected to having more veg in our diet for a change. Deep-fried cordyceps mushroom (炸蟲草花) - these were really nice! The batter was crunchy and not soggy at all. Yum. Pan-fried taro patties (香煎芋頭餅) - not as crunchy as the lotus root patties, as these were more soft and chewy inside, but still tasty. Earth Hour was celebrated for the 10th year tonight, and I participated for the eighth year. As we did last year, Hello Kitty and I went out to the Kowloon Public Pier next to the Hong Kong Cultural Centre. However, this year we also took Kuma out with us, and arrived just before 8:30 p.m. Some of the buildings on the Hong Kong side across Victoria Harbour had already gone dark. One by one, most of the major buildings visible on the waterfront turned off their exterior lighting, and the stretch from Sheung Wan to Fortress Hill was uncharacteristically dark. Last year's offender HSBC got the message this year, and turned off all their lights - including that huge LED panel - at their HSBC Main Building early this year. The China Resources Building also turned off the lights at the top of their building. Most people went along with the effort, and even slow pokes like Kweichow Moutai (贵州茅台) managed to turn off their neon sigh by 8:40 p.m.
Aaaaand... as I was still feeling full and digesting the huge dinner last night, I joined a couple of friends for a late lunch. I've been hearing a lot of good things about Sushi Mori Tomoaki, but since I don't eat a whole lotta sushi in this town, I never bothered to check it out. My friend who works near the restaurant thought it would be worthwhile for me to make the trek, and I'm glad I did. Since my friend knows the chef, we decided to follow his recommendation. Little did I know that we would be having dinner omakase (お任せ) for lunch... We asked the chef not to serve us tuna, as is my usual practice. Steamed egg custard (茶碗蒸し) - this came with the usual shiitake mushroom, fish, fish cake (蒲鉾), and shredded crab meat. Unfortunately the crab meat had the texture of steel wool... but the yuzu (柚子) fragrance was lovely. Marbled flounder (真子鰈) - came with two parts. Chewy and springy. Served with salt. Sooo... before I had a chance to fully digest my huge dinner at Amber last night, I had to go eat another huge meal... at my favorite Cantonese private dining space. Apparently I have a fan in North America who is sadly deprived of good Chinese/Cantonese food, and asked to be taken to what is now my favorite spot for Cantonese cuisine. So here we are. Barbecued Iberico pork (黑毛豬叉燒) - this was one of the two requested dishes, and it certainly did not disappoint our first-timers. Without the usual reddish honey glaze, the soy sauce-dominated flavors were more pleasing to the palate. I have been remiss. It's been more than four months since my first (and previous) #OccupyAmber session, and that is no way to get a movement going! So when Hello Kitty suggested that we go somewhere nice for dinner tonight, I knew there was no better place to take her... PLUS, it would appear that she's never had the famous Hokkaido sea urchin dish that Chef Richard Ekkebus is threatening to take off the menu at Amber! This needed to be rectified ASAP. So the two of us walked in, got seated, and it wasn't long before Richard very kindly came to greet us. We had looked over the menu and found the current degustation menu pretty interesting, but as I follow three of Amber's chefs on Instagram, I've been seeing a bunch of delicious-looking dishes on my feed lately. After getting the nod from Hello Kitty, I asked Richard to send us whatever he fancied, without "a foot on the brakes" in terms of quantity. Our welcome drink was the mushroom tea I had on my last visit, with a mushroom steamed egg custard at the bottom, some chiffonade of seaweed (わかめ? ), and a mix of Pu'er tea (普洱茶) and mushroom consommé. Mushroom macarons with pumpkin purée and orange zest. Love the pickup from the citrus zest. It's been a while since No Fish and I last met up for a meal, and we finally found some time for it. She had initially set her sights on a (relatively) new and exciting opening, but given I was scheduled to go to the very same restaurant 10 days prior, decided that she would like to finally check out Quest. A quick look at the restaurant's FB page, though, showed that recent dishes no longer carried the same Vietnamese bent. This was a little disappointing for me, but Chef Que explained to us that the lighter and more Asian dishes are available in the warmer months, while he serves up his "comfort food menu" in the colder months. After going through the menu, No Fish and I could certain see what he meant by "comfort food"! Yellowtail tartare - I loved this. Nice cubes of raw yellowtail with some fresh herb persillé, topped with little pearls of cream cheese, pickled red onions, and dill. The sauce covering the yellowtail was creamy and came with an interesting kick, almost like horseradish. Probably my favorite dish of the evening. A group of us had the privilege to be invited to dinner at Neighborhood tonight. We were all friends with Chef David Lai, and he decided to host a dinner centered on some delicious beef. You see, David was in Germany recently and had enjoyed beef from a local breed, and he decided to bring some back and share with his friends. I arrived to find the back room of the restaurant half-occupied by friends, and as more of us arrived, we eventually settled on separate tables for boys and girls. I guess the conversations were likely to be very different! First came the charcuterie platter. Yes, I went straight for the lardo... and was surprised that the air-dried beef was particular tasty with rich flavors. After some more bread and butter, the main event arrived. My one and only previous visit to Ming Court (明閣) came six years ago, after the restaurant's first promotion to 2 stars. The dinner ended in disaster, and most - if not all - of the attendees have never set foot in the restaurant since then. In fact, we collectively snorted with disdain at the mere mention of the name of the restaurant. But a friend was visiting from halfway across the globe, and we haven't seen him in a few years. After multiple rounds of discussions, one of our friend's friend - who works for Cordis Hotels - finally stepped up and offered to get us a table here. Since we know our visitor had pretty good experiences with this place in prior years, the Great One and I bit our tongues and joined the party. As the friend from Cordis was dining with us, we were set up in a private room and had quite a few staff fawning over us. Obviously a very different experience from 6 years ago, when we were left fuming over the service. The menu was also designed to showcase a few of Chef Mango Tsang's special creations - and those the previous chef, who happened to be his younger brother. We started with some snacks while waiting for everyone to arrive. These deep-fried crispy wafers of lotus root were really delicious, although I would have preferred them with slightly less salt. The candied walnuts with sesame were nice, too. I can't tell you the number of times over the last 3 months I've been asked if I have eaten at VEA. It is arguably the hottest new opening in Hong Kong, and during the soft opening period my social media feeds were flooded with pictures and posts about the place. The PR for the restaurant had also very kindly invited me to go for a taste but, as usual, I preferred to wait and go on my own dime. So I finally succumbed when some friends invited me to join them tonight. They had had a very good meal there, and were eager to introduce me to the place. I arrived to find that, regrettably, we had counter seating. Now, for someone who chases after good food all the time, I am surprisingly ambivalent about open kitchens. During a good meal, I'm so busy with my photography, tasting, taking notes, and trying to carry on conversations with my dining companions... that I actually don't have a lot of time to observe and watch what is being done by the kitchen staff. The downside here is that the counter is raised pretty high, so we end up sitting on these tall, awkward bar chairs. Since I'm pretty particular about taking pictures of my food, and do it from different angles, I found myself getting off the chair to try to shoot from a low angle for just about every single dish. And the process of getting in and out of my chair became really tedious... especially when, at every instance, the staff thinks that you're trying to go to the men's room. Anyway, I'm pretty sure no one else would have this problem... I'm just the weird and picky one. The leaves were made with pesto, farro, egg white, and pine nuts. The flowers were made with sour cream, potato, and beetroot. The grissini branches were made from black olives and black pepper. These were a little too crunchy and hard for my liking. My 3-day trip to Bangkok wasn't just focused on fine dining establishments. We are in Thailand, after all, and one must make time for the more "authentic" and "local" fare - especially given how many times we've been told by Thais that food at the places we we've been visiting were "not really Thai food". HaoKouFu and I discussed how we could fit these into our itinerary, and decided that we would have to hit these places for late-night supper. The two of us each suggested a place, and as it turns out the two eateries were literally within 50m of each other - on Thanon Mahachai. We checked a number of blogs and looked up TimeOut Bangkok, and were satisfied that both places would be open till the wee hours. So... on my first night here, we didn't eat very much at the party for Asia's 50 Best Restaurants. Not that the food wasn't good - can you imagine a bunch of Asia's best chefs being served crap food?? - but we just wanted to get a taste of what's out there. So the Great One, HaoKouFu, and I met up with a couple of fellow attendees from Hong Kong and headed over. It was around 11:40 p.m. when we got off the taxi in front of Pad Thai Thip Samai (ผัดไทยทิพย์สมัย) - arguably the most famous eatery serving the "national dish" of pad Thai (ผัดไทย). But the restaurant was closed, and there were no tables out on the sidewalk. We were stunned. Wasn't this place supposed to be open till 1:30 or 2:00 a.m.?! What happened?! This was certainly a disappointment, but all was not lost. All we had to do was to walk a few steps to Raan Jay Fai (ร้านเจ๊ไฟ). Jay Fai translates as "Sister Mole" in Thai, and refers to the chef of the establishment. Yes, she does have (more than one) prominent moles on her face, but one might not notice at first glance due to the skiing goggles she wears while cooking. That's because she cooks over charcoal fire, and she needs the goggles to protect her eyes from the embers blown around by the electric fans she uses to keep the fires hot. She also keeps her hair neat under a knitted hat, wears makeup, and gets around in pink Wellington boots. And she wasn't particularly happy about a group of tourists surrounding her taking pictures and videos. So this was it. My most anticipated meal on this trip. The Best Restaurant in Thailand, and the Best Restaurant in Asia - that is, according to Asia's 50 Best Restaurants, sponsored by S.Pellegrino and Acqua Panna and announced just 2 nights ago. I became a big fan of Gaggan Anand when I went to his pop-up in Hong Kong. He was doing something that was unique and very appealing to me - using modern cooking techniques to present traditional flavors... in this case Indian cuisine. To me, he's the Indian counterpart to Alvin Leung of Bo Innovation... only better. Because of my self-imposed exile from Thailand for the last few years, I was never able to come to Gaggan, his eponymous flagship restaurant in Bangkok - until now. I pinged Gaggan and told him I was finally making my way to Bangkok, and we made arrangements for me to come to dinner tonight - since he would be busy with his obligations with Asia's 50 Best Restaurants for the previous few days. I scheduled my trip to accommodate tonight's dinner, because there was no way I was leaving town without dining here! Since both the Great One and HaoKouFu had already dined here a few days ago, I was faced with the prospect of dining alone - which isn't ideal, but I'm a big boy and I've done it plenty of times. So when the Jet Setter pinged me last night and told me he was in town, I was only too happy to invite him to join me for dinner tonight. I showed up at the restaurant before doors opened at 6 p.m., and got a warm welcome from Gaggan himself. He very kindly seated us at one of the chef's tables with a view of the kitchen, and gave word to the restaurant manager - who goes by the simple nickname of 'A' - to take care of us. This was gonna be fun! Even though I normally don't drink wine with spicy food, I decided to take the sommelier up on his offer of a few glasses. 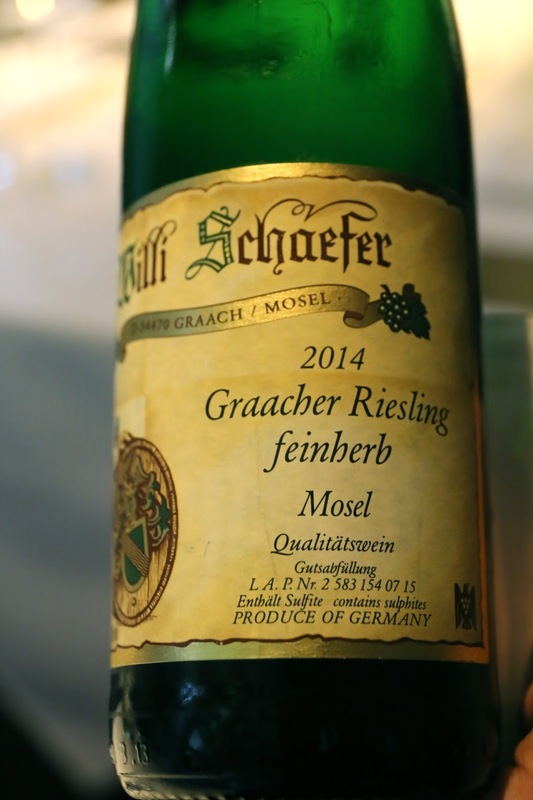 2014 Willi Schaefer Graacher Riesling feinherb - acidity was pretty high here. Dry on the palate but there is ripeness on the finish. Dinner starts with a series of snacks, which we are asked to pick up with our hands... as no cutlery is provided. No fork use, but no problem! Dewdrop - I had seen pictures of this posted over the last couple of days, and was really looking forward to this beautiful dish. Made with grape juice, aloe vera, and (sansho? 山椒) flowers. I rolled it into my mouth just like a giant dewdrop, then popped the membrane with some pressure. Incredibly refreshing and clean flavors. What a great way to kick off dinner! Another day in Bangkok means another day of eating. We start the day with lunch at Issaya Siamese Club, the celebrated flagship restaurant of Chef "Ian" Kittichai which had just clinched the No. 19 spot on Asia's 50 Best Restaurants, sponsored by S.Pellegrino and Acqua Panna. I had the pleasure of visiting the Hong Kong outpost a couple of months ago, so I was pretty exciting about going to "the original". We were debating about whether to take a taxi or public transport. Just 3 days ago, the Great One had gotten lost in a taxi trying to get there... and in fact never made it to an event there. With that in mind, I looked at the almighty Google Maps and figured that we should opt for public transport, since the restaurant looked like it was just 300m away from the Khlong Toei MRT station. We were hot and thirsty when we finally sat down, so we ordered a round of fresh pomelo juice. That really hit the spot. After a quick discussion, the four of us chose not to take the set menus on offer. Instead we would pick and choose à la carte, and each of us ended up choosing something... although a few items we wanted were not available. After flipping through the menu, we decided to take the Bo.lan Balance menu. However, since I don't care for tom yum kung, I asked to change my soup to the one listed on the Bo.lan Brief menu. Part of the problem that come with my self-imposed exile from Thailand is that I don't get to see my friends. One of my favorite chefs left Hong Kong more than two years ago to pursue new opportunities in Bangkok, and I haven't seen him since. Now that I was finally in town, there was no way I was gonna leave without catching up with him. 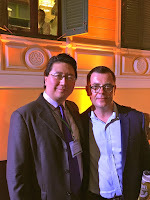 Fortunately, I ran into Chef Vincent Thierry at the awards ceremony for Asia's 50 Best Restaurants yesterday. We finally got a chance to catch up, and I got a download about what he's been up to since his arrival. He seemed really happy, and I was happy for him. We made plans to pay him a visit this afternoon. Shortly after 5pm, I walked the short distance from W Bangkok to the (significantly) shorter of the two towers that make up the MahaNakorn CUBE, and headed to the Vogue Lounge on the roof. This is one of the handful of Condé Nast International Restaurants dotting the globe, and the very first of a number of outlets that Vincent will be in charge of. Now that the main event for this trip is over, it's time to eat! I've been away from Thailand for 8 years, and I was determined to catch up on some Thai food. So I rounded up the Great One and HaoKouFu and headed for the original location of Krua Apsorn ( ครัวอัปษร) on Thanon Samsen. Krua Apsorn came highly recommended by the local expert on Chowhound, and a quick search showed that my friend Chubby Hubby and a whole host of other bloggers and foodies are also big fans. Apparently she used to cook for the royal family before opening her own restaurant, so I figured we can't go wrong with this place. The location is a little far from where we're staying, as it's near the National Library in the very old part of Bangkok - and therefore inaccessible by BTS or MRT. Thankfully there wasn't much traffic, and we made it easily by taxi. I had done a little bit of homework and came up with 3 dishes I wanted to order, and the others came up with the dishes that they wanted. Miang kana (เมี่ยงคะน้า) - naturally this arrived first. One is supposed to mix all the ingredients and wrap them in the Chinese broccoli leaves - which is different from the wild pepper leaves often used.